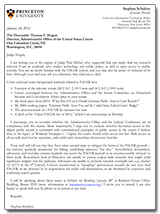 I wrote a letter to Judge Hogan, the recently appointed Director of the Administrative Office of the US Courts. I wanted to make the case directly to him that the courts should do the right thing — and that what they are doing right now is against the law. I was assured by his colleagues on the bench that Hogan is a reasonable and judicious person, and that he would at least hear me out. Yesterday, his administrative assistant replied to me. She said that he had forwarded the letter to the people in the Public Access and Records Management Division (PARMD), and that he didn’t want to talk to me. She said that I could contact Public Affairs Office if I wanted to discuss it further. The PARMD folks have, in the past, forwarded my requests for things like the congressionally mandated Judiciary Information Technology Fund Report to the Public Affairs folks, who of course never respond. The Judicial Conference may, only to the extent necessary, prescribe reasonable fees… to reimburse expenses incurred in providing these services. The Committee intends to encourage the Judicial Conference to move from a fee structure in which electronic docketing systems are supported primarily by user fees to a fee structure in which this information is freely available to the greatest extent possible. For example, the Administrative Office of the United States Courts operates an electronic public access service, known as PACER, that allows users to obtain case and docket information from Federal Appellate, District and Bankruptcy courts, and from the U.S. Party/Case Index. Pursuant to existing law, users of PACER are charged fees that are higher than the marginal cost of disseminating the information. Whether or not PACER is subjectively inexpensive is immaterial. The law says that the fees can only reimburse for the expense of the service, and the courts are charging more than that. End of story. Nevertheless, PACER is — subjectively — expensive. Although it costs “only 10 cents per page,” the system charges not only per page for documents, but per “page” of search results, and per “page” of docket listings. It is easy to quickly run up a huge bill unless you are looking for one particular thing and you know exactly how to find it. This is not the Internet way of doing things. If you are a researcher or investigative reporter who needs access to the full corpus of PACER records for analysis, my back-of-the-envelope calculations put the price at about half a billion dollars. It’s true that PACER users can apply for a fee waiver from a particular district or bankruptcy court. There are, of course, a few catches. First of all, obtaining a waiver requires filing a separate request with each court, which may grant and revoke the waiver at its discretion. Individuals with fee waivers are prohibited from redistributing these public records. Many classes of individuals are not even eligible to apply, including the media. There is also my personal favorite, “An exemption applies only to access related to the case or purpose for which it was given.” So, if you are willing to give the courts your credit card, file a formal application to all of the courts for which you seek access, if the courts like the “purpose” that you state, and if they don’t arbitrarily decide to revoke your waiver, you can download (but not share) documents. What happens when a watchdog organization applies for and receives a fee waiver? Evidently they receive it, only to have it revoked shortly thereafter. Likewise, if you’re an academic, don’t criticize the court that gave you the waiver, because they may not renew it next time. Of course, anyone without a fee waiver is paying more than the cost of the service — in violation of the law. In fact, they’re paying the freight of all of those greedy fee-waiver freeloaders. As long as you don’t rack up a PACER bill of more than $15 per quarter, you won’t be charged. Apparently this works for some users. The courts claim that “approximately 65-to-75 percent of active users have fee waivers for at least one quarter.” I don’t know what constitutes “active users,” but I can certainly believe that during some quarters, many registered users don’t use PACER much. I can also imagine that quite a few people try using PACER but give up quickly because the interface is so non-intuitive and the search is so inferior. I guess it’s nice of them to automatically waive some fees, but it doesn’t come close to addressing the more fundamental problems — or making the fee policy legal. This is false. It’s shameful that the US Courts are misrepresenting the law. They should know better. Their excuse here is that the appropriators have indicated in a series of committee reports and letters that they have no problem with the courts expanding PACER fee use to other areas. The appropriators have a vested interest, which is of course to appropriate less. That being said, they have not made any changes to the law. Letters and report language are not the law. The law is the law. Three years ago, the US Courts started a project in partnership with the Government Printing Office. Some courts were given the option of sending opinions over to the GPO, which would publish them — get this — for free! At the moment, only 19 of the 95 district courts are participating, but the courts recently announced that they would allow any other interested courts to join the trial. So, perhaps in a few years, all courts will upload their opinions to the GPO. The metadata aren’t as complete as what’s on PACER, and it’s hard to monitor for updates. More fundamentally, the archive omits everything other than final opinions (and it relies on judges to appropriately flag what is an opinion and what is not, which they have had trouble doing in the past). It is useless for following ongoing cases or for many types of research, but it’s better than nothing. Of course, it’s just a distraction from the fact that the courts are not following the law with respect to PACER fees. Fun fact: Historically, the courts deposited all paper case materials with the National Archives and Records Administration. You could obtain every record from a proceeding at cost from NARA. Per NARA disposition schedule N1-021-10-2, the courts were supposed to begin depositing electronic records 3 years after a case closed, but to date they haven’t deposited any electronic records. This is a good one. The Administrative Office will tell you that you can go to your local courthouse to access PACER records for free. Well, maybe not “local,” but you can go to the district, bankruptcy, or circuit courthouse and access PACER. Of course, you can only access records for that particular court. You can’t access other PACER records. You also can’t download the records. You can only view them. If you want to print them, that will be 10 cents per page. That’s not legal. I have reproduced their pie chart here. Let’s consider the first sentence. 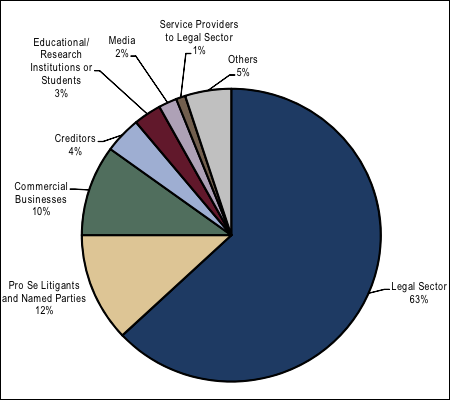 Where in this pie chart are the Department of Justice and all other governmental entities? I can’t tell. Can you? They say that “The majority of ‘other’ users are background investigators,” so it can’t be that category. I guess that the government users are part of the “Legal Sector.” We know that in 2009, the Department of Justice alone paid $4.167 million in PACER fees. So, taxpayers are already paying millions per year in PACER fees out of general tax funds. The unstated implication here is that the “high volume users,” who are “major commercial enterprises or financial institutions,” can afford to pay for PACER, so why not tax them at a rate higher than actual cost for access to the public record? Presumably, the courts think that it is acceptable to violate statute because it affects mostly well-endowed users. Here is how the PACER system architecture works: every court runs its own local PACER server, with local support staff and a private leased network link to Washington, DC. Are you a system administrator? Are you an average citizen who has heard the word “cloud” in the past five years? Does this system architecture seem insane? It is. It is even more offensive in light of the fact that the GSA has had, for years, a streamlined government procurement system for cloud hosting. This system is certified at FISMA level 2 security, and is hosted in a “private cloud” for the government, which is good enough for the Department of Homeland Security. It is provided by companies like Amazon at only a fraction higher cost than their commercial offerings. The courts could host all of the PACER services in the cloud — tomorrow — for under $1 million per year. They could allow all of these local system administrators to control their own PACER installations. They could obtain greater cost savings (and security) by further consolidating PACER hosting and system administration. Of course, they feel no pressure to do so when they interpret the law to allow them to charge whatever they deem necessary. At some point, PACER added the option for judges to specify that a particular document was an “opinion.” When users download these documents, they are not charged. But what is an opinion? There have been years of hand-wringing over this question. Courts have been wildly inconsistent in their rate of accurately flagging opinions. The Administrative Office commissioned an expensive study. This is all ridiculous, because the law makes no distinction between fees for opinions versus other records. What’s more, in order to find the opinions in the first place, the average user has to search for them (and pay) and view the docket (and pay). Fun Fact: The PACER software allows each court to enable an RSS feed. This single feed lists every new document filed in that court (downloading the documents is not free). The feed maxes out at 200 entries. In busy districts, more than 200 documents can be filed in a matter of hours. I mentioned the uselessness of the RSS feed to a PARMD employee, who replied, “My understanding of RSS, (and I’m not an RSS expert) is that the selecting of individual cases (or individual articles/topics) from an RSS feed, is accomplished through the RSS reader.” Right. Well, in any case, the courts recently admitted that “70% of the district courts have not implemented” this useless feature anyway. The courts commissioned an extensive and unscientific study in order to determine that users were happy with PACER, and did not want free access. On the other hand, a Stanford Law librarian’s survey indicated that 95.5% of academic law libraries limited or rationed access to PACER for fear of paying too much. Public schools allowed students to spend less on PACER than private schools. The Administrative Office conducted a multi-year “multistakeholder” study in order to determine the “next generation” requirements for the electronic filing and PACER systems. No-fee access was not an option, nor were fees mentioned in the final report. None of the committee members represented the general public. I contacted the one person who was identified as a “stakeholder representative” for academia, who informed me, “I view it as my job to pass along thoughts; the committee decides what recommendations to make.” Of course, even if 100% of academics and the general public were happy with PACER fees, they’d still be against the law. We have allowed the courts to pass off these silly (and irrelevant) excuses for far too long. It’s time for Congress to fully Open PACER. Perhaps it’s also time for PACER users to exercise some self-help by suing. Steve, I think these are all good points, but I think they ignore one major problem. The federal judiciary is poor. As the Chief Justice likes to remind us in his annual reports (http://www.supremecourt.gov/publicinfo/year-end/year-endreports.aspx), the judiciary gets $7B out of the entire government’s $3.7T. That’s 0.2% of the federal budget for the entire third branch. There’s a huge problem of costs, not only for practical goods and services (e.g. keeping courthouses open, literally “paying the rent”), but also attracting judges to the judiciary; it is increasingly difficult to attract good talent when compared with the pay scales in private practice (and more federal judges are leaving the bench for lucrative compensations in private practice than ever before). So it’s easy to say that they should stop paying for non-PACER things with PACER funds, or should make PACER itself more available, but where are they supposed to get the money? Yes, I understand they shouldn’t be doing what they are doing now, but it will be difficult for them to change if they don’t have good funding options. I don’t understand the appropriations process very well, and I fear it would doom your bill if it tried to add additional financing to the courts, but I worry about it being perceived as an unfunded mandate. I also feel like I should acknowledge, I had intended to write to the Chief Justice (who chairs the Judicial Conference) after the September 2011 announcement of the PACER fee increase from 8c to 10c, and failed to do so, to my shame. I wonder if seeking a reduction in the PACER fees to the level of actual costs might be a more successful strategy, even though it wouldn’t be anywhere near as awesome as totally free. I’m not ignoring the fact that the courts are poor. I agree that they should be better-funded. There is a solution to that problem. That solution is not unbridled cross-subsidization that is tantamount to an off-the-books tax. The law *already* says that they may only charge actual costs. They aren’t following the law. The actual cost of providing PACER should be so minuscule as to be a tiny blip in their budget. If they had a sane architecture, that would be the case, but they feel no pressure to do so. The bill will not be perceived as an unfunded mandate. The version that is introduced will have sufficient offsets. The House requirement for deficit-neutral bills means that it would be foolish to introduce anything else. There would be some minimal savings to the federal courts if Pacer were free. I worry about my Pacer bill and sometimes I phone a US District Court and ask the human being who answers if anything has been added to the docket since such-and-such a date. Those phone calls are a drain on the court clerk personnel. Those phone calls would cease if Pacer were free. For what it’s worth, Richard, there is no charge to login to PACER and do a Query by docket number for a single case. And doing so will report to you the last update date. So unless your concern is items added within the course of a single day, the system does allow you to solve that problem. I hate like I’m sounding like a PACER apologist. That’s not my intent. These are in no way secret documents, and if there is worry about things which need to be redacted they could keep them for a month, then make them available for Google, Bing, and any other search engine. I would try to convince ONE judge or one court to mark everything going into the system as public or free or whatever. There is a right to have an attorney paid for by the state when you are accused, but not to get access to court documents. As to the lack of funding, I have no sympathy for Judges since a series of decisions within my lifetime where Judges – not the legislature at the appropriate level – imposed a tax. If they wish to be legislators or executives they should run for those respective offices. prohibited unless expressly authorized by the court. I’d have to do some research to confirm, but it seems like this is a prior restraint in violation of the First Amendment. I don’t see how they can lawfully condition a valuable government benefit on whether the person intends to exercise their speech rights after they obtain what the benefit provides. This would be like a public library offering free copies to indigents but only on the condition that they not let anyone else see them. Feds, per their own bureau of justice statistics (googlable) were responsible for about 1% of total US arrests, about 185,000 federal arrests per year 2009. Therefore they are small potatoes compared to state and especially local courts. I would not bet though that their budget is the major source of their funding. I think that winston’s point is that most judicial activity takes place in state courts. That is true. I hope that the feds can lead by example. They’re leading the wrong way in Mississippi. I would list this as an absolute truth, not an excuse, but a fact by reason of how it operates. At least based on what you described here, I would never as a poor person even be allowed to access PACER. So, it stands to reason that “The heaviest users are rich” simply because us poor can’t afford to use PACER. Some of us can’t afford even 10 cents per page when a photocopy page (and I work in an office we go through 10,000 pages per month in the least busy times, and often far more than that). The costs per page are really roughly 0.25 to 0.35 cents per page. And that is printed hard copy. Digital data (which in my opinion should be literally FOR FREE, because it is unlimited in nature of ability to copy, is a whole lot less than 0.25 cents per page… and how do you determine one page of digital data anyway?) In fact, I maintain millions of pages (in print) of information available for literally less than one penny per day and hence could disseminate it only for the cost of electricity which is very cheap. So, yes, I would say that the rich are the highest users of PACER simply because the system is so expensive (not cheap at all), that only the rich or at least the upper middle class get to use it at all. I suspect that my idea of rich might differ from yours though. I consider anyone making $50,000K per year very rich. I could live like a king on $50,000K per year. Legal professionals may not feel very rich even when they are making $250,000 per year, and of course Obama and Romney both don’t even consider someone rich until they are making over that. Of course, money or not, I will never get to use PACER because I just don’t qualify for access to government records, I am a second class citizen because of my medical problems. Unless the government posts it on a public website, or someone defying the government shares it on their public website, I can’t get access to anything.